The Novodevichy Convent (New Nunnery or Maiden), surmounted by golden domes, is one of the oldest religious complexes in Moscow. 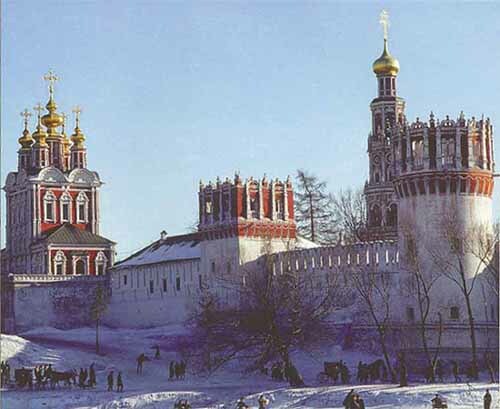 The walls and the towers were erected in the end of 16th century during the reign of Boris Godunov. The Convent was directly associated with the political, cultural and religious history of Russia, and closely linked to the Moscow Kremlin. It was used by women of the Tsar’s family and of the aristocracy. Members of the Tsar’s family and entourage were also buried in its cemetery. The Convent provides an example of the highest accomplishments of Russian architecture with rich interiors and an important collection of paintings and artefacts.